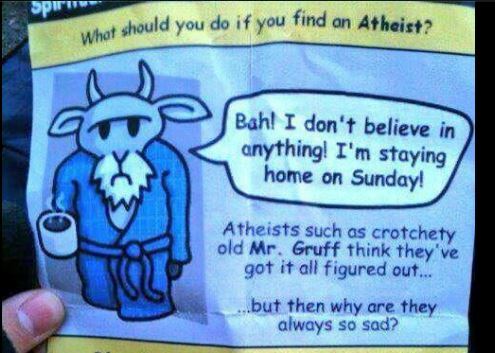 Recently a pamphlet designed for Christian children made its way around Facebook. 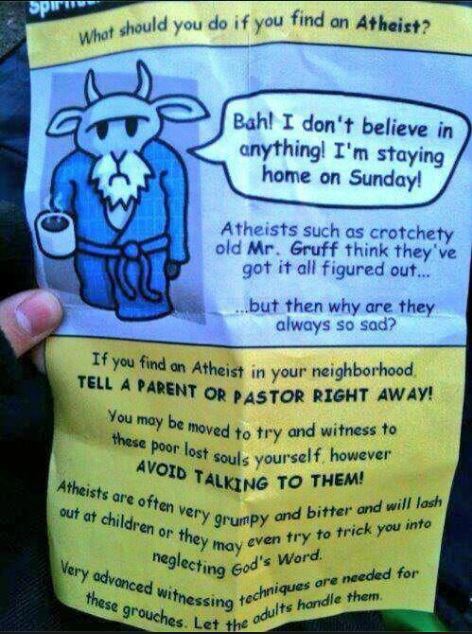 It warned God’s little lambs to avoid grumpy sad people called “atheists.” The pamphlet, as it turns out, was satire, but it pokes fun at some real stereotypes about atheists. A private school curriculum called Accelerated Christian Education, which claims placement in 6000 schools, includes cartoons in which the atheist characters are rude, mean and drunk; and bad things happen to them. Population demographics suggest otherwise, of course. Atheism is far more common among elite scientists than among imprisoned criminals, for example, and some of the most peaceful and equitable societies on earth are also the least religious. But believers persist in fearing that godless people are amoral, that unfettered by religion the world would descend into the anarchy and bloodbath depicted in the Left Behind movies. For me the meaning of life, or the meaning in life, is helping people and loving people.Here are 20 short quotes from Johnson’s assemblage, each of which is crushingly at odds with the standard stereotype of the angry, selfish godless scrooge. All quotes are taken with permission from A Better Life: 100 Atheists Speak Out on Joy and Meaning in a World without God.